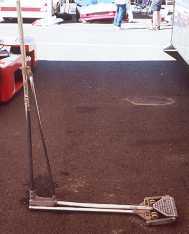 These show some examples of low clearance fastjacks used under low cars. Note the commercial jack can reach under a Europa far enough to come up directly under the forward box section. The home made unit is safer as it moves further overcenter, but the handle is a weak point and needs another brace to strengthen it. I have no idea whose these are, I simply took these photos at PIR for some list folks who had never seen this style jack before. This is the Commercial unit lowered. And in use under the rear end. And fully raised and significantly overcenter.